I came home from work yesterday to discover my 2 year old in this size 12M dress with giant garden gloves on. It was adorable. 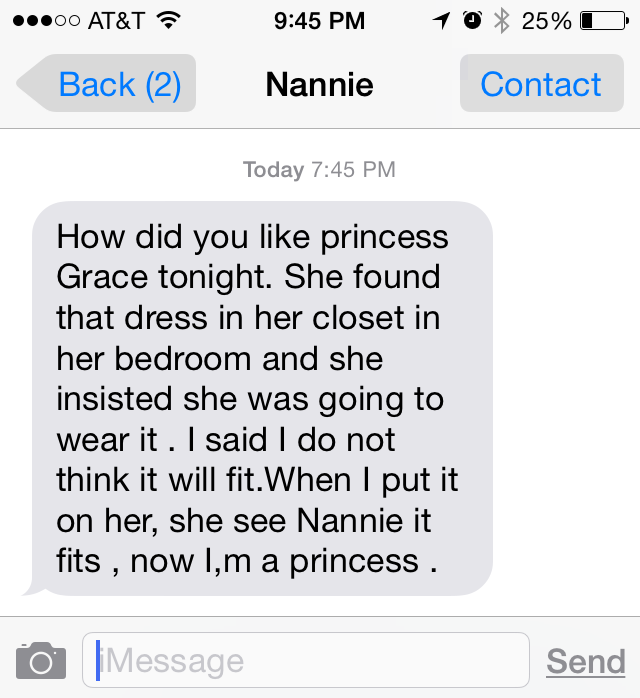 Here's the backstory about why Grace resurrected a dress from 1 year ago. And also, Toddlers. Insisted. And OHHH I believe it. 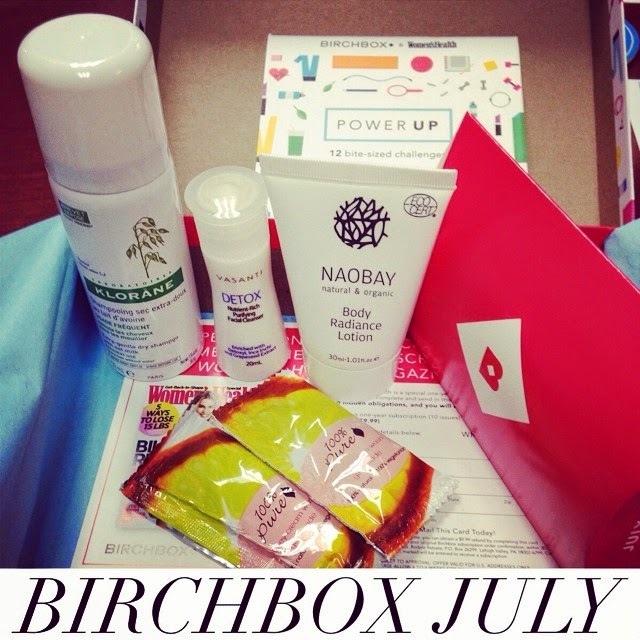 My July Birchbox - Power Up - was all about Energizing my routine and encouraging healthy new habits. I always love getting dry shampoo spray in my Birchbox and was excited to try this French version. It has a robust spray of dry shampoo and smells really nice - not too sweet. Also, I tend to gravitate toward French products due to my French degree, and also it reminds me of shopping the Pharmacie aisles in Marseille (this one right here actually) when I studied abroad. French beauty manufacturers and I share a mutual respect for white space. This body lotion from a Spanish company smells SO GOOD. I actually tweeted with the company to find out just what that smell was. There you have it. I keep it at my desk and keep sniffing my arm. Weirdo. I know. I'm not an eyeliner wearer so Josie's Mom was the recipient of this product. 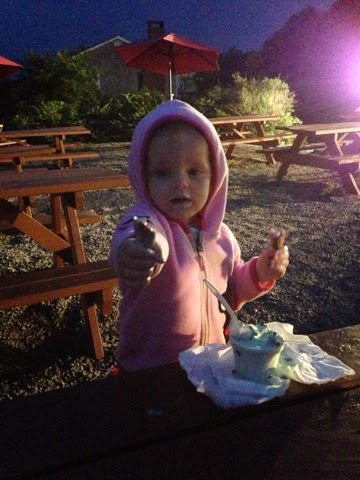 I'll have to follow up and let you know how she likes it. If there's one thing my skin needs this summer is a good detox. I love Summer but the elements, so so much sunscreen and perhaps a few too many Cuba Libres on vacation have started to catch up to me. This product has so many ingredients designed to renew and refresh my very tired face. I just wish it also came with one voucher for a 4 hour nap. To be honest, I don't love fumbling around with these little packets with wet hands in the shower but gingerade was too tempting not to try it. The smell was great and I still have another packet to try it again! 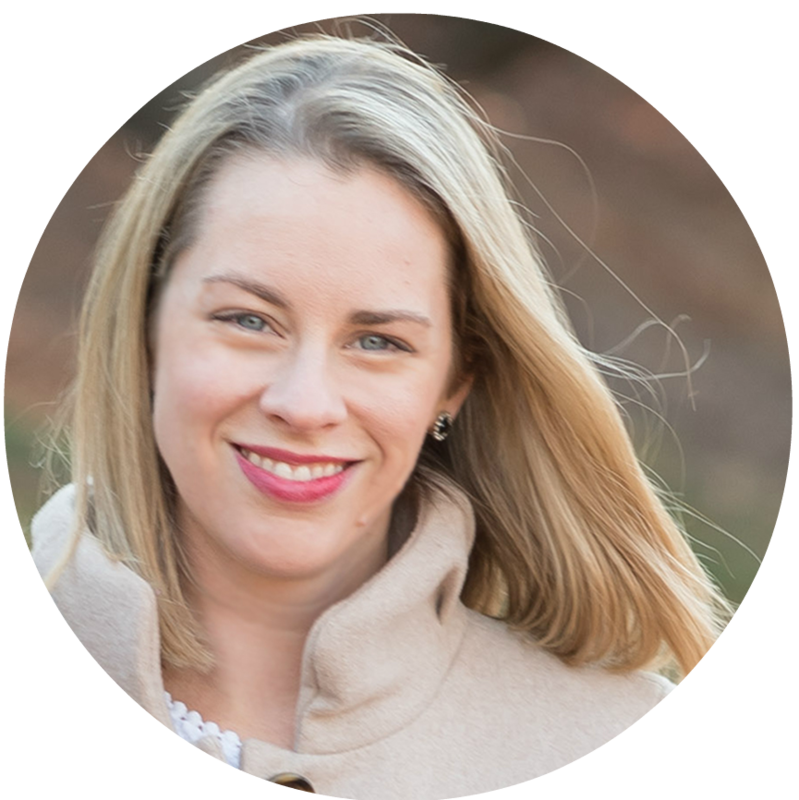 The bottom line: I was very pleased with my Birchbox this month, as I usually am. Looking forward to August! I just pre-selected a bronzer so I'm excited to try it. Have I mentioned that Birchbox makes a great gift? You can gift a 3-month subscription for only $30 (it's $10/month). Have I also mentioned that you can do me a huge favor by ordering through my very own link? I'll get a few extra Birchbox points so I can buy my very own full size NAOBAY lotion and have one at home and one at the office. In one more indulgent post that is probably more for me to look back on years from now... I present you with the vacation finale! We all knew I couldn't sustain a daily recap for 7 days. I basically stopped typing them up in bed while Grace slept on the stressful no power/near grease fire night. After that I struggled to report that day's events to their full potential and the rest is history. Now that I'm almost a week out I'm all...wait, what even happened on my vacation? 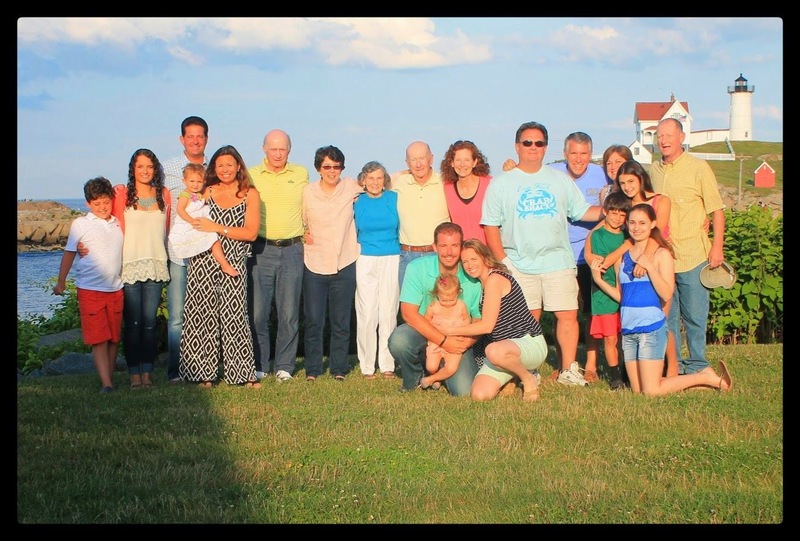 First up... Family Reunion Night where we attempted to make the Family photo an annual tradition. It's never easy (herding cats always comes to mind) but at least I had a tripod this year! Please ignore the shadow on the left. I tried to warn them but they wouldn't stay out of it. Pick your battles. Here's the winning photo. Again. 19/20 ain't bad. Sorry Landon. Next we really pissed off Grace by extending the photo taking process. 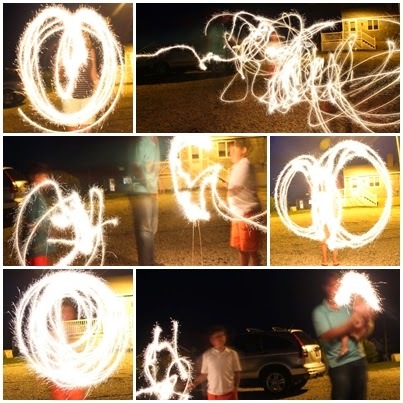 Once the sun set we tried our hand at Sparkler Photography. I set up my tripod, turned the shutter speed down low and Matt lit some sparklers. Unfortunately it didn't quite work out as planned (to write fun things with sparklers) because monitoring two 10 year old boys with sticks of fire ended up requiring a good deal of supervision. 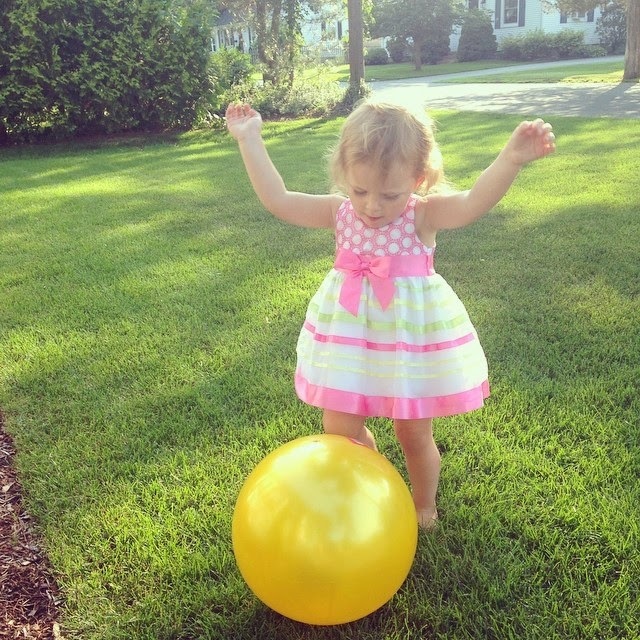 Once Grace caught wind of what we were doing and demanded to join in the fun it was game over. Hoping to try this again this weekend with my sister! Day 3 started off in a deep deep fog and never really lifted where we're staying out on the point. We finally left the house after lunch and walked to the center of town about a mile away. 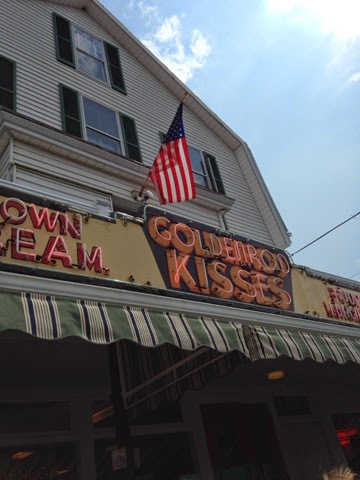 York Beach is famous for this taffy shop, Goldenrod where they are still churning out the taffy 100+ years later. We had to try the peppermint, molasses, and French toast. Grace fell asleep not long after we left and was still sleeping during our jaunt around town so we kept walking to Matt's Grandparent's house on Long Sands Beach. We stayed and visited for a while before Matt and I snuck off for a little date lunch at a restaurant a few houses down, Stones Throw. 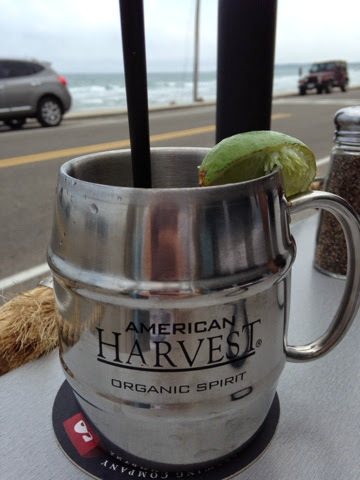 Right across from Long Sands Beach, we found the menu (both food and drinks) to be surprisingly modern and upscale. Great food and we'll try to get back again before we leave. Once we left lunch, we loaded into the MDX with Matt's parents and Grace and that's when the adventure began! It had just started to rain when we were on our way to the grocery store. By the time we had to get out it was a full on downpour. Matt and I made a run for it while his parents and Grace waited in the car. 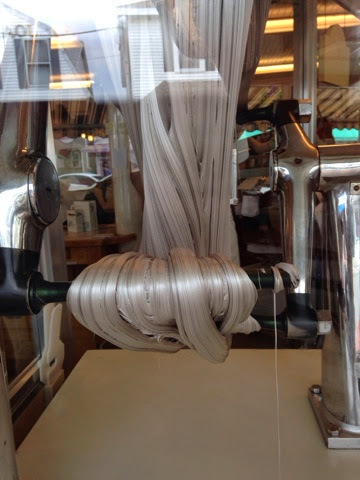 We only had a few items to pick up for the night's meal - linguine and clams. Last stop- clams. We could hear a thunderstorm roaring overhead. As our five dozen clams were being counted out the lights cut to blackness in the grocery store. Not even an emergency light, let alone generator backup! 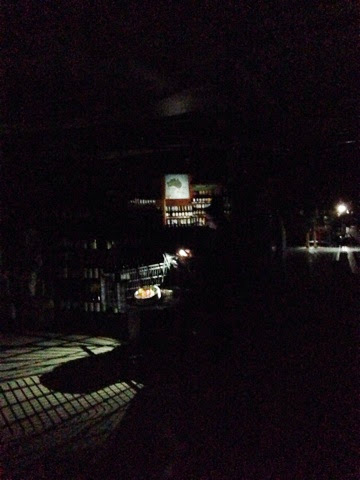 Luckily everyone has a flashlight on their phone and they started popping on, nicely illuminating Hannaford's wine selection. By the way, can I just say how nice it is to have wine in the grocery store. 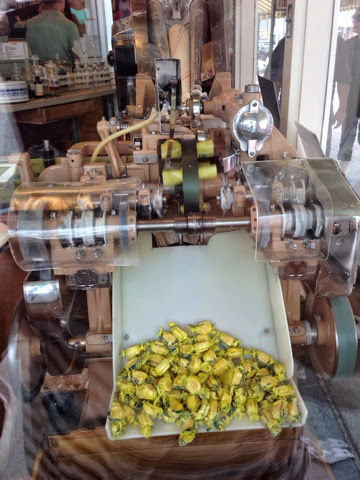 We don't in Rhode Island and it's so annoying to have to make a 2nd stop (Wine-O rant over). After what seemed like an eternity, but was probably only 10 minutes, the generator kicked on, we weighed our clams and got the hell out of Dodge. The rain had stopped by the time we got back to the car. Poor Grace was freaked out because she overheard that Mommy and Daddy were locked in the store. The ride back to the beach house required some bobbing and weaving because whatever storm cell that came through left a path of destruction and many downed trees right through the center of York. We had to turn around twice before we were able to get down to RT 1A. 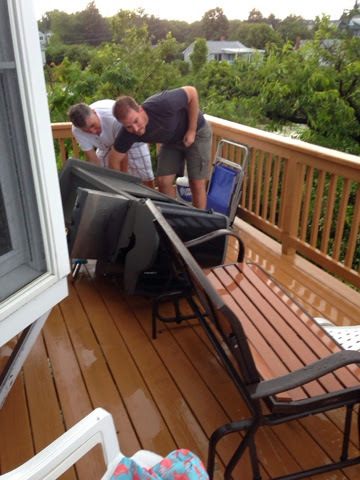 When we did get home, poor Aunt Barbie, who had been left to ride out the storm at the beach house by herself had just emerged from the basement to find the giant Weber grill had been blown over. With the lights still out, we were thankful to have a gas grill and some power in an iPhone so we could still access the Linguine with Clams recipe. Our disastrous afternoon turned into a disastrous evening when I had to learn Adult Lesson #104 of "Do not pour cold wine into hot oil" and sent scalding hot popping oil all over the kitchen. Matt had to step in to remove the pan and thus save us and the house from a grease fire. The clean up? Yeah, let's just say I never want to have to go through that again. Faced with no hot water, limited dish towels and no plates to eat dinner on, my mother-in-law took matters into her own hands and ripped a beach towel right down the middle with such survival-instinct force that I knew she was riding high on adrenaline. After the oil incident I was demoted to dish dryer with my new beach towel/dish towel. The happy ending? My father-in-law made a fantastic Linguine with Clams and the Oyster Bay was still cold. We finished just in time because things were starting to get pretty dark in the house. 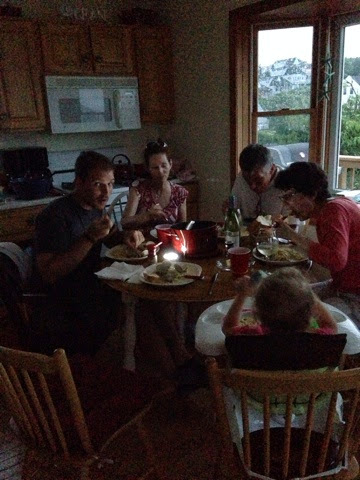 Literally minutes before we decided we had to eat all the ice cream in the house the lights popped back on. Day 2 started nice and late thanks to a late rising toddler. Grace actually slept until after 9:30 and it was glorious! I've been going to bed with her (the sleeping arrangements are a little weird and not entirely toddler friendly) so I've had a very good sleep track record since we've been here. We thought it was going to rain this morning but it was beautiful and much warmer than yesterday. Got a bit of a late start at the beach but got to sneak in a little sand time before the tide rolled in. I still can't get over the wild tide swings here. We had to leave the beach and go back to the house for lunch because there was literally no sand once the tide came up. Grace got her muddy puddle fix on the way back. After lunch the fog cleared up and we had to drag Grace out of the water after more than 2 hours of running back and forth. 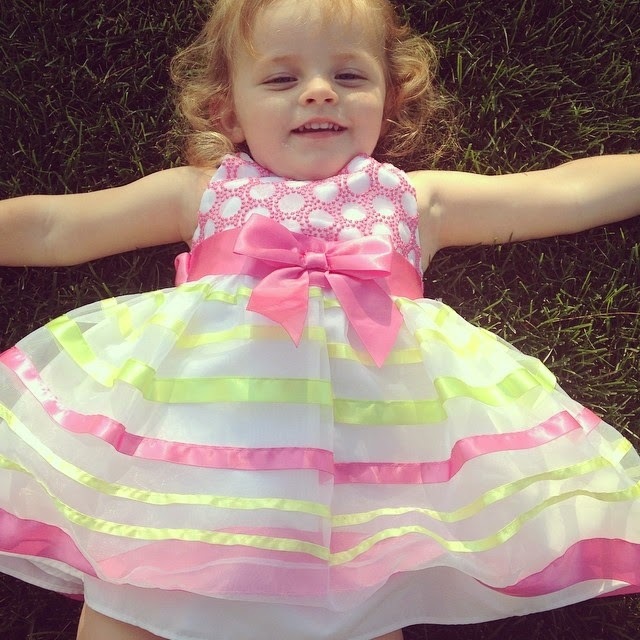 She's got the diaper rash to prove it. To round out the day, we had dinner at the Oarweed in Ogunquit. Awesome seafood. 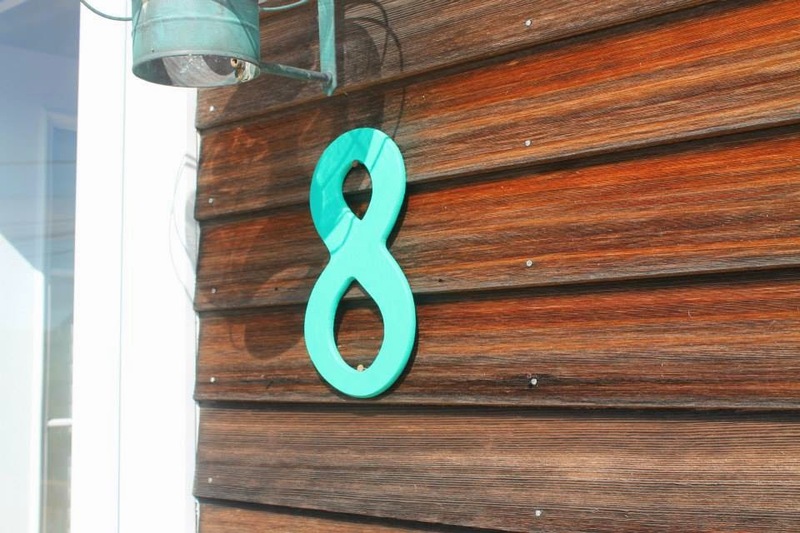 Decor is interesting. Everything (and I mean everything) is covered in shellac, tables, chairs, the walls. It's a little weird. But again, the food is great. 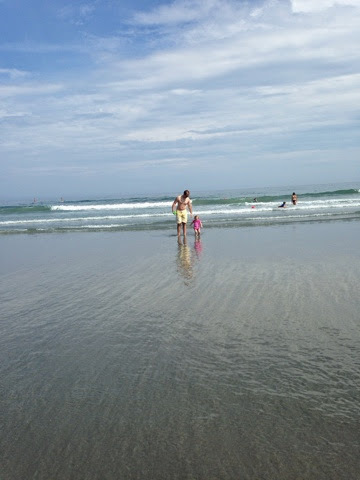 This was the 2nd year in a row we've made the trip a few miles north to lovely Ogunquit. 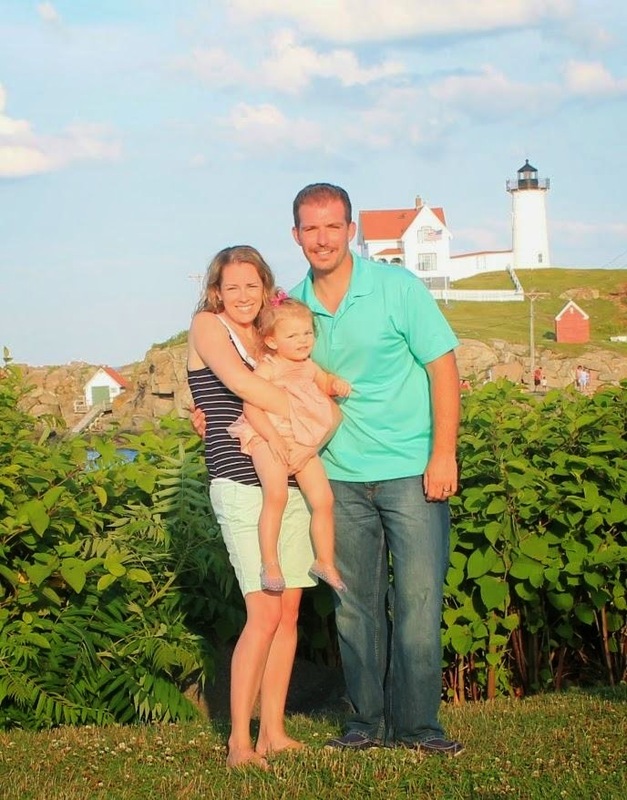 We're having fun up here in Maine, despite the fact that it's at least 20 degrees colder than last year! 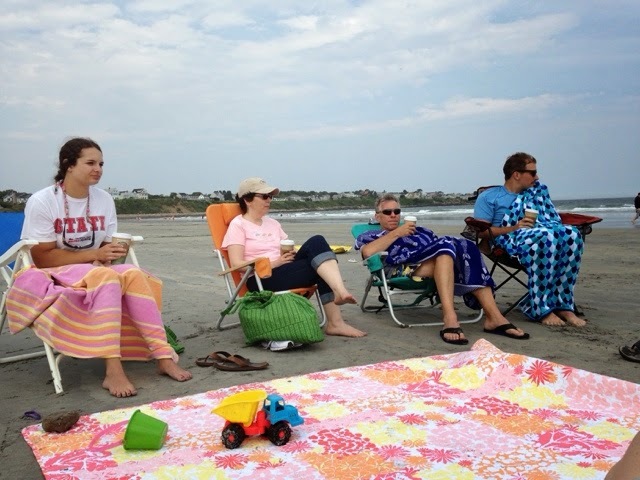 In fact, I'm sure we will remember Summer 2014 as the year we had to order hot coffees on the beach. Another first, riding around all week in the 3rd row of our SUV. We're rolling deep this week! Despite the cold (especially tonight! 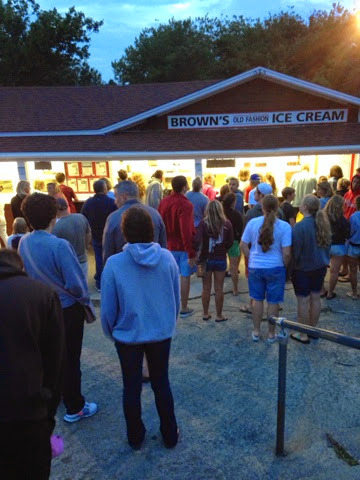 ), we had to make our nightly run to Brown's Ice Cream- where even the kiddie size is entirely too much. Post by Grace and Josie. In 4 days we leave for our annual (if you go two years in a row does that make it officially annual?) 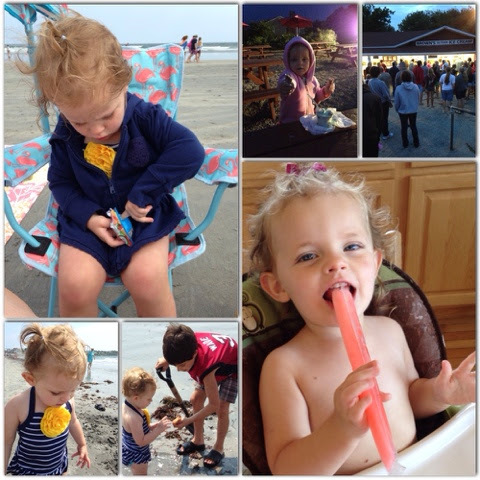 vacation week in York Beach, Maine. Woohoo! 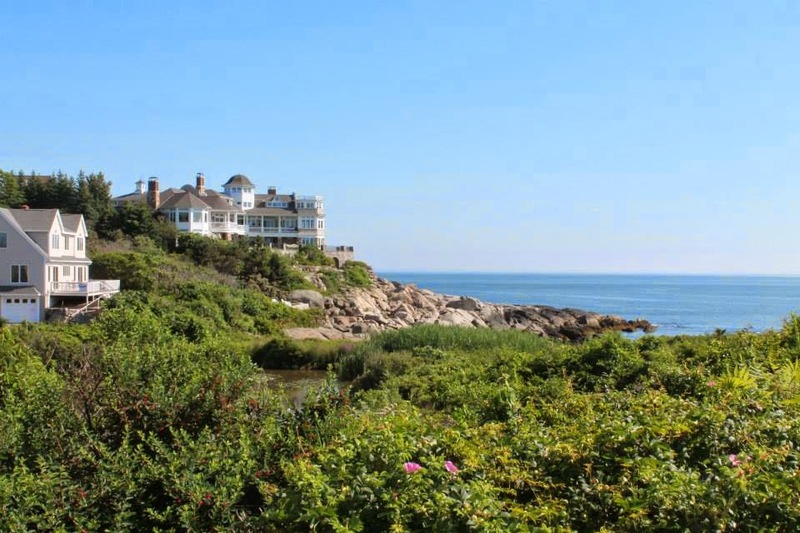 If you like lobster, lighthouses, and ice cream you'd adore this beach house. 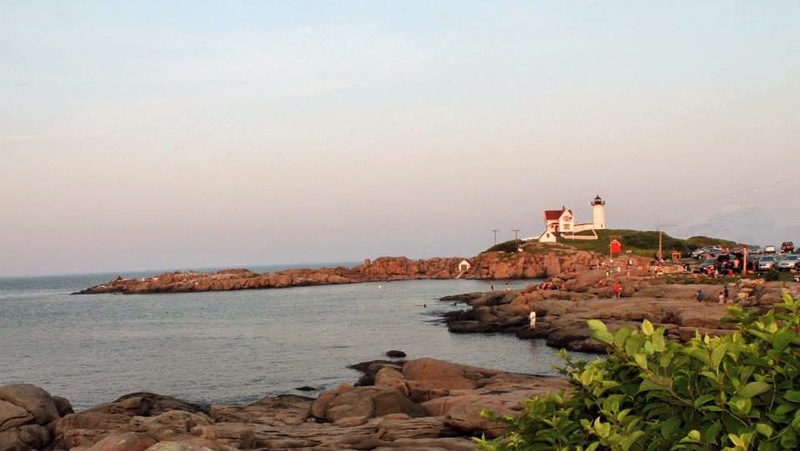 It's literally a panorama view of the Cape Neddick Lighthouse and Fox's Lobsters to the East, Brown's Ice Cream to the West, a quaint cove to the North, and Long Sands beach to the South. Last year during our July week it was literally 100F+ every single day. SO hot. With no AC, because it's Maine - how hot can it get? Yeah... we used to use that excuse in Rhode Island too when I was a kid. "It's only really hot for a few days during the summer, we don't need AC. Just get a window fan." Yes, I'll remind you of that again Mom when it's 90F at night for 7 days in a row. How can you wear red, white, and blue to celebrate the Fourth of July but not go overboard? One key is accessories! Each color looks great when paired with one or the other, however add all three and the look is a bit intense. Unless you're going for that Fourth of July SuperFan kind of look and in that case, I expect to see and Uncle Sam hat, red star sunglasses, and a red, white, and blue sparkle wig. 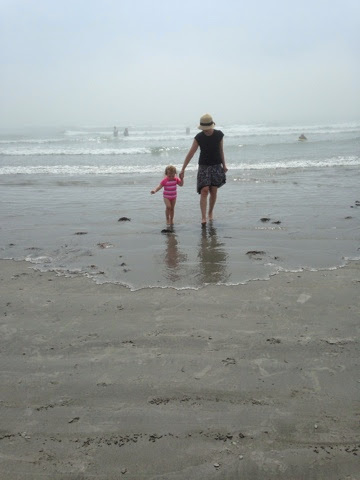 What's in my Land's End Extra Large Tote beach bag? 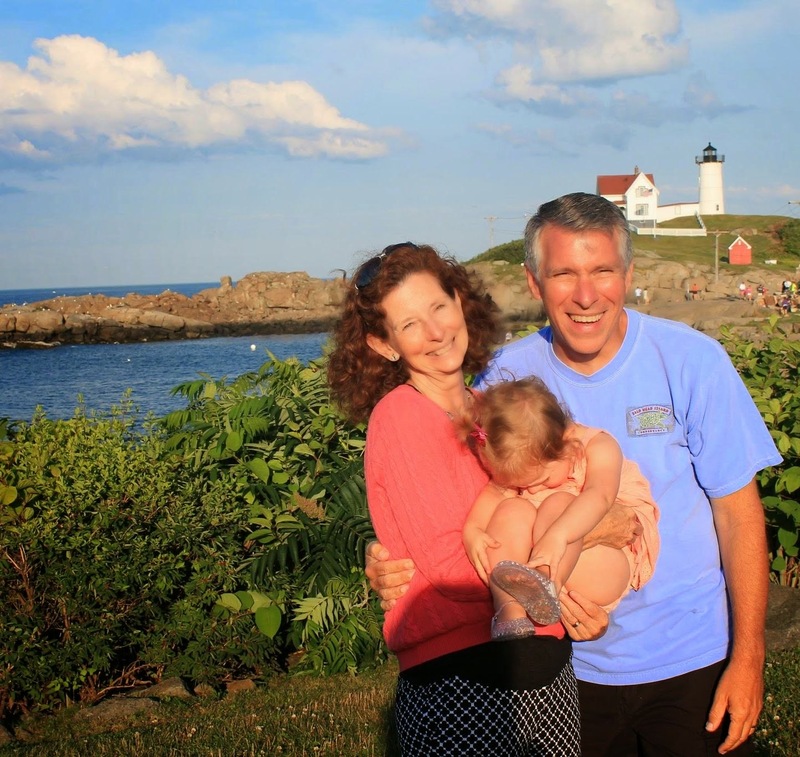 What's in my Land's End beach bag? The answer may surprise you. But let's back up for a minute. First of all, the million dollar question (or the one I always ask at the beginning of each blog post featuring a "gushing" blogger): Did Land's End pay you to say this? NOPE. Y'all should know by now that I post about things I love. 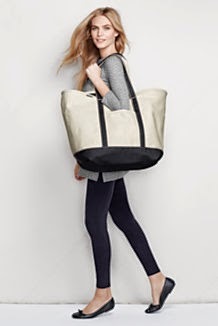 So I slapped down my credit card (and coupon, of course) and had to explain to the husband why I needed a gigantic bag - just like the rest of you. Inspiration struck during an earlier beach trip this year. 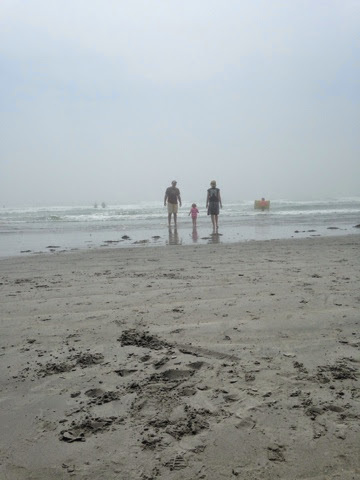 A trip in which I was caught hauling multiple bags, a chair, cooler, and a sand bucket. 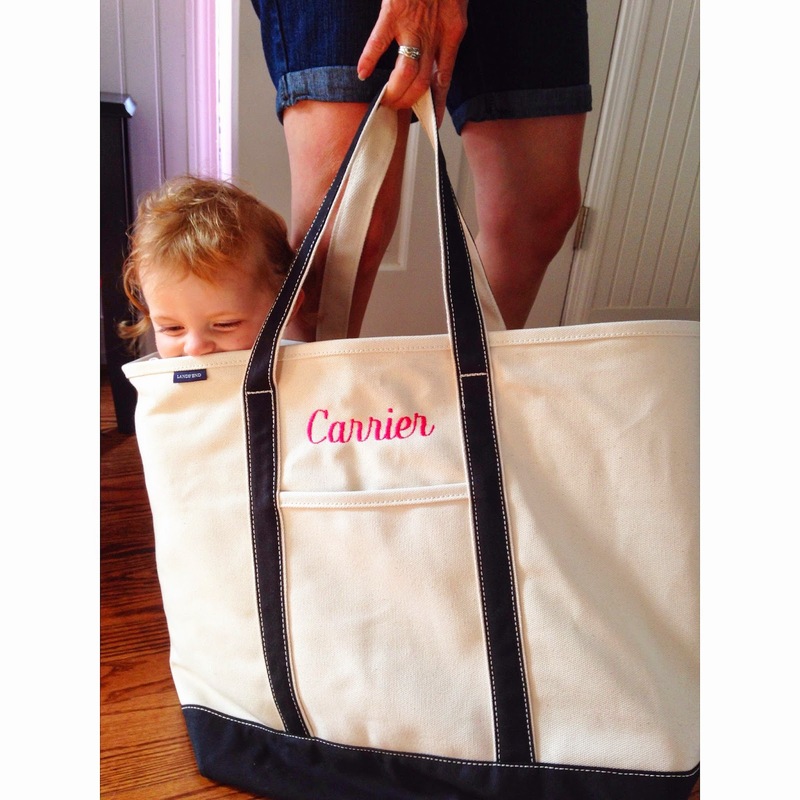 Grace has an adorable monogrammed canvas tote from Pottery Barn that was a gift from her BFF Lily. I cram that thing to the brim everyday with the toddler essential - diapers, wipes, extra clothes, sunscreen, bug spray, yogurt raisins, random toys, my old license (no idea why that's in there but I also haven't taken it out, I'd like to think Grace just likes to look at my mug shot)... It's even perfect for her beach bag because I just throw in a towel and go. But. I have needs too. Granted, now that I'm a Mom I no longer need to pack my fashion magazines (because I'll never get a moment to sit down) but I at least need a towel, some clothes, maybe some snacks! Add Dad to the mix and we're talking about a family of towels, picnic lunch, first aid kit, extra clothes etc etc. I'll stop rambling and get to the point. I needed a bigger BAG. A giant MOM-sized bag. And I knew just where to go. www.landsend.com So I went there and started to read the comments. "I got the XL but it was just a little too big." Perfect. So I painstakingly created and customized the perfect Mom Family bag. Black for a little edge and pink but not so much that Dad won't carry the thing. Perfectly coordinating black trim and pink coral embroidery. On our next outing I'll fill it up and snap a pic so you can see how it holds up. Grace (clearly) loves it too. 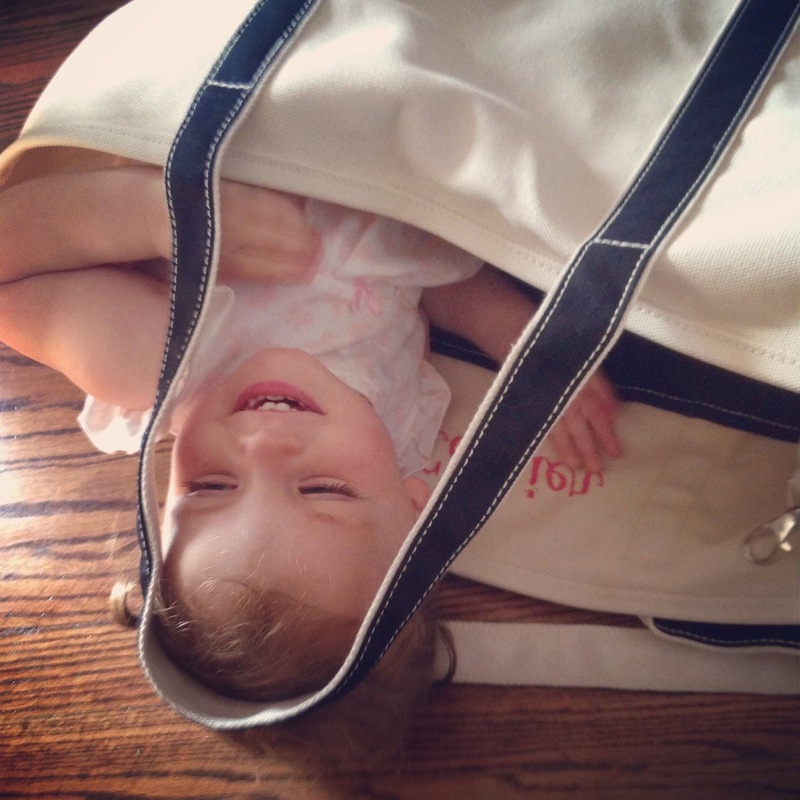 When she walked in the door last night I said, "Gracie, look at Mommy's huge new bag!" 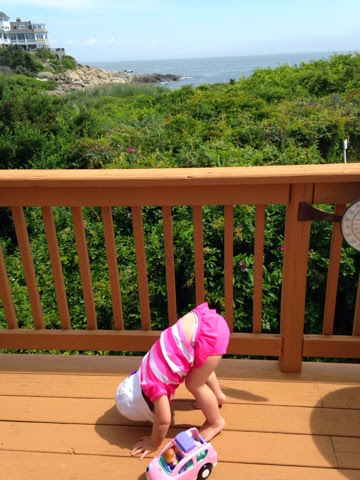 To which she replied, "I can go in it?". Sure why not. 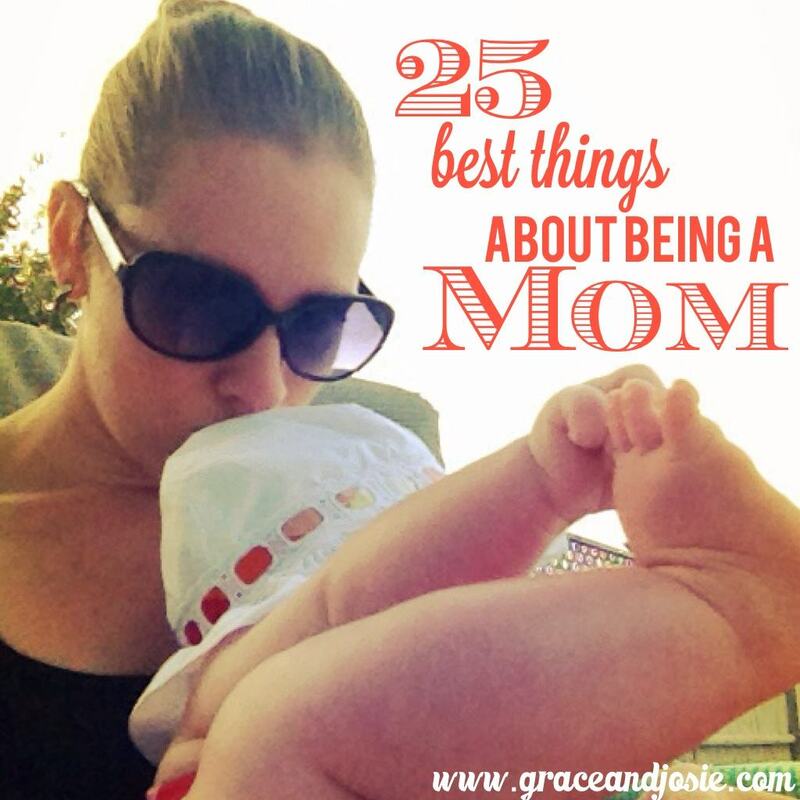 Do you have a favorite Mom bag?